Chances are if your last name is either Nygaard or Mack, you'll probably end up in victory lane at some point during the weekend of The Seitz. Both Wade and Casey have combined to sweep the Saturday night victories through the first seven years of the event's history. Last year's John Seitz Memorial Saturday night feature lineup was the inverted finish from Thursday night’s feature. Casey Mack came from the 10th place starting position to take his second checkered flag of the 2013 season in the caution-filled 25 lap race. It didn't come without some late race drama, however. Nygaard drove from 19th to pass Mack for the lead on the final lap. 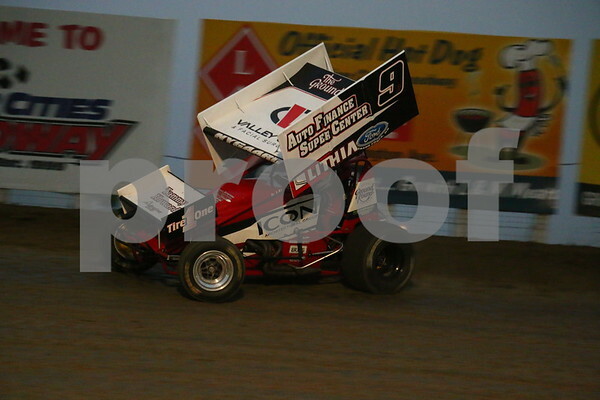 The two drivers drag raced to the finish where Mack edged out Nygaard by a fraction of a second at the line. Austin Pierce came from 18th to third, Bob Martin finished fourth, and Chris Ranten passed 12 cars to round out the top five. Racing kicks off this Thursday night at 6:30pm with NLRA Late Models, NOSA Outlaw Sprints, and Wissota Midwest Modifieds. If you can't make it to The Bullring this weekend, you can catch all the action via Pay-Per-View on Speed Shift TV.